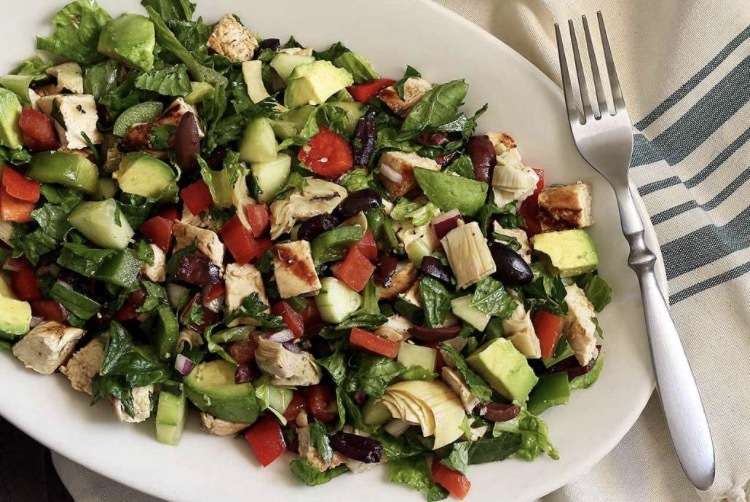 For our 1st Whole30 recipe, to help you on your Pre-Summer 30Day Challenge, we decided to choose this tasty and easy to make Greek chicken salad. It makes a hearty meal for either lunch or dinner, and It’s a nice and tangy favorite go-to of ours! To marinate the chicken: In a dish, combine the lemon juice, olive oil, oregano, salt, and pepper and mix together. Add the chicken breasts to the dish and rub both sides in the mixture. Cover the dish with plastic wrap and let marinate in the refrigerator for at least 1 hour and up to 4 hours. To make the dressing: Combine all the ingredients in a resealable container and shake vigorously. Refrigerate until ready to serve. Assemble the salad: cut off any dark tips and the bitter white bottoms from the romaine leaves. Cut the lettuce into 1-inch strips and place in a bowl that is large enough to hold all the salad ingredients. Scatter the rest of the salad vegetables over the top. To cook the chicken: Heat a nonstick skillet or grill pan over high heat. Add I tbsp olive oil to pan. Add the chicken breasts and cook, turning once, until well browned, about 5-6 minutes on each side or until cooked through. Let the chicken rest on a cutting board for a few minutes before slicing it into thin strips. Right now, think of three meals you could make in 15 minutes or less, with ingredients you’ll always have on hand. Then, write them down and post them in a prominent place in your kitchen or on your fridge. Bingo! You’ve got a plan for those nights when you arrive home hungry, cranky, and too tired to whip up a gourmet meal—and when your favorite (less healthy) take-out restaurant is likely to be calling your name.